While watching Oliver Ekman-Larsson's historic shorthanded goal 5 seconds into the 3rd period last night against the Toronto Maple Leafs we were reminded that not only are the Leafs a tire fire, but that Jonathan Bernier has a tendency to let in some very weak goals. While every goalie is allowed to let in a softie, Bernier's had some bad luck with pucks from outside his own blueline with the Toronto Maple Leafs. Given that's he's in a commercial for LASIK MD eye correction surgery (with 2014 Spengler Cup Champion, Francis Boullion!) we find this pretty funny. That's from the opposing blueline and Bernier would claim post-game that he lost it in the stands. This is a fair excuse given that it would be easy to lose sight of the puck in a sea of empty platinum seats to start a period at the Air Canada Centre. This one I remember very well having just got to the bar after a beer league game hoping to catch an exciting finish to a big game. Nope. This was a fun one because there was some confusion as to why the play wasn't called icing (it was early into the introduction of hybrid icing in the NHL), but Bernier badly misplays the puck off the endboards and it banks off his skate and in. While the goal belonged to Canes' defenceman, Ron Hainsey, give full credit to Radek Dvorak for beating out Morgan Rielly to the faceoff circle and cancelling the icing. Another tough one for Bernier as Islanders defenceman, Calvin De Haan, lets a clapper go from outside the blueline that deflects off Dion Phaneuf's stick above the faceoff circle. Granted it was deflected, but it was deflected over 45 feet out and he was well out of his crease to cut down on the angle. Bernier makes plenty of saves, but we're starting to call him "Bad Goal Bernier" given his propensity to let in more than the occasional soft goal. 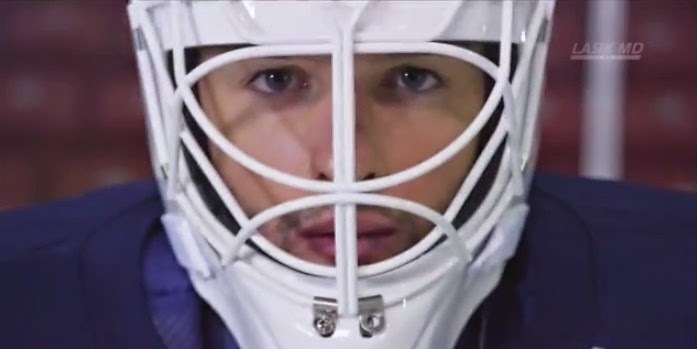 Only a matter of time before LASIK pulls their advertisement campaign featuring Bernier (and an ex-NHLer) if he keeps letting in goals from 65+ feet out. Stick tap to Brad for the bad goals flashback.